Νew- fangled “Aloni Studios & Apartments” (completion in 2003) waiting you for the best and unforgettable holidays. Friendly atmosphere, spectacular view to the Ionian sea, peaceful place and reasonable prices are guaranteed the above mentioned. 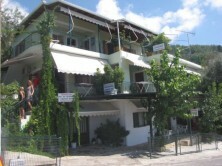 “Aloni Studios & Apartments” are located in the village of Athani, on the southwest coast of Lefkada Island, within a hair’s-breath of famous beaches Porto Katsiki and Egkremni. If you have some free time to spare, there is no better way of seeing Lefkas than by visiting it. Lefkada is the only island that is connected with the rest of Greece by a pontoon bridge. It is a mountainainous island full of green, stip cliffs and huge sandy beaches.